Christmas can be a magical time of year, with all of the glittering lights, greenery, snow-capped houses and people in a festive frame of mind. And Christmas markets are especially wonderful – they exude holiday fun and spirit. These are just a few from around the world that are worth a visit. Marienplatz with the Christmas market in Munich, Germany. 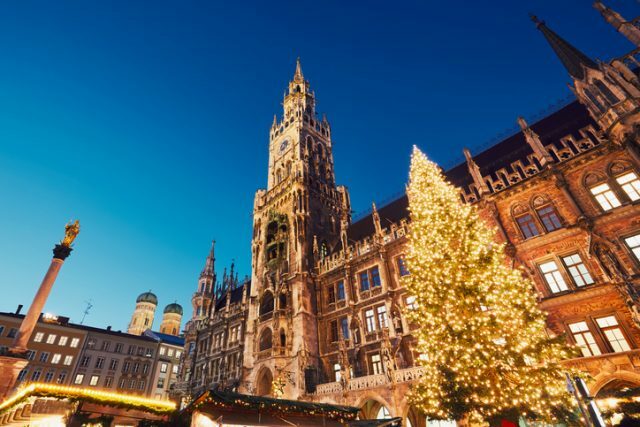 When you imagine a traditional Christmas market, Munich must certainly come to mind. The Christkindlmarkt dates from the 14th century. It has been located in the city’s Marienplatz since 1972, and covers over 20,000 square meters (almost five acres). 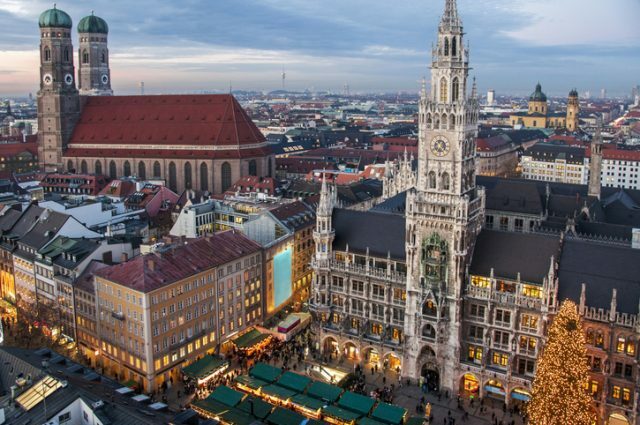 It spans from the Marienplatz to the tower of the Altes Rathaus (the old town hall) and its inner courtyard, to the Richard-Strauss-Brunnen, and the Rindermarkt. Town hall and frauenkirche Munich, Germany, panoramic view of two famous landmarks with Christmas decoration during sunset. 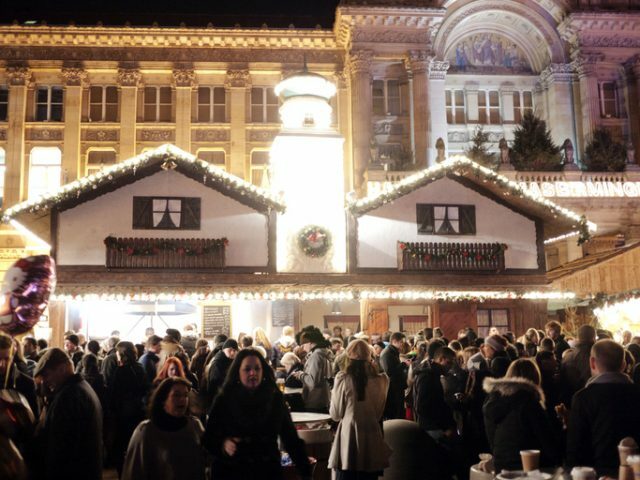 With its traditional Bavarian style, the market is awash in handmade items, glass decorations, and fantastic Bavarian food, not to mention Glühwein, a delicious warm mulled wine. Right in front of the new town hall stands a huge Christmas tree, and 2,500 candles, which fill the area with an ambience that is truly magical. Rothenburg ob der Tauber, Germany, November 30, 2012: People waiting at the town square for the opening ceremony of the Reiterlesmarkt (Christmas market). 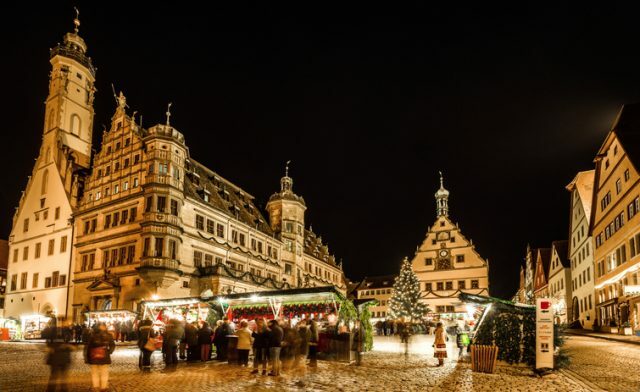 Another delightful German market can be found in the medieval town of Rothenburg ob der Tauber. Called the Reiterlesmarkt, this festive market dates back to the 15th century, and has barely changed over the years. The highlight of the festivities is the appearance of the Rothenburger Reiterle at the opening ceremony. Night view on the world famous Christmas market in the medieval Franconian town of Rothenburg ob der Tauber. While the origin of the Reiterle is no longer known, he is believed to be an envoy of sorts who has come from another world, carrying the souls of those who perished. In the past, people were afraid of the sight of him, but in today’s market the horseman is a friendly figure, bringing good news and gifts. 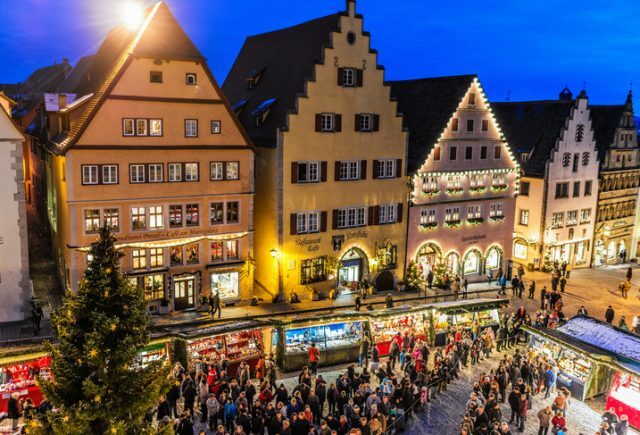 Like the Munich market, Rothenberg’s has lots of handmade items, mulled wine and food. The local specialty is called a Schneeball (snowball): fried dough covered in powdered sugar. December 10, 2011: Shoppers and visitors enjoying the Birmingham Frankfurt Christmas Market and Craft Fair, Victoria Square, Birmingham, UK. 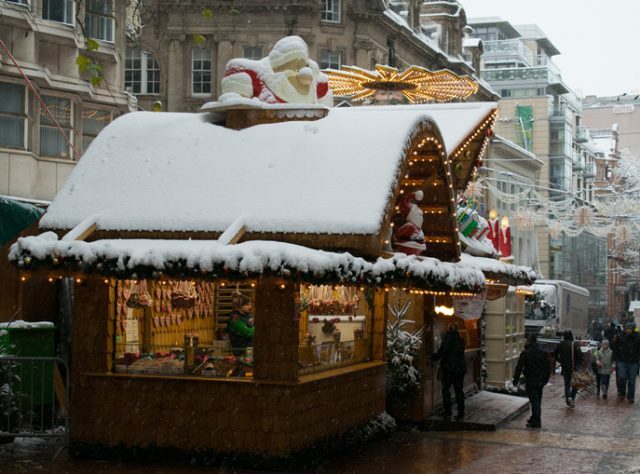 The largest authentic German Christmas market outside of Germany or Austria can be found in Birmingham, England. The market began in 2001 with only 24 stalls and has grown to 180 for the 2018 season. Birmingham, United Kingdom, December 10, 2017: City Centre, German Market on the snowy day, when it snowed for 16 hours without stopping. Although this photo was taken during opening times on the Sunday, when the Christmas market is normally crowded with people shopping, on this day it was almost empty due to cancelled buses. It features a wide variety of traditional German food, including pretzels, schnitzel, and bratwurst, as well as beer and Glühwein. Vendors sell decorations of all kinds, from hand carved wooden ornaments to glass to gingerbread. Like similar markets in Germany, Birmingham’s Glühwein mugs double as handy souvenirs, with a picture of the market and the year on each mug. Crowds walk up Rue Merciere to the Christmas Market at dusk on December 8, 2013 in Strasbourg, France. 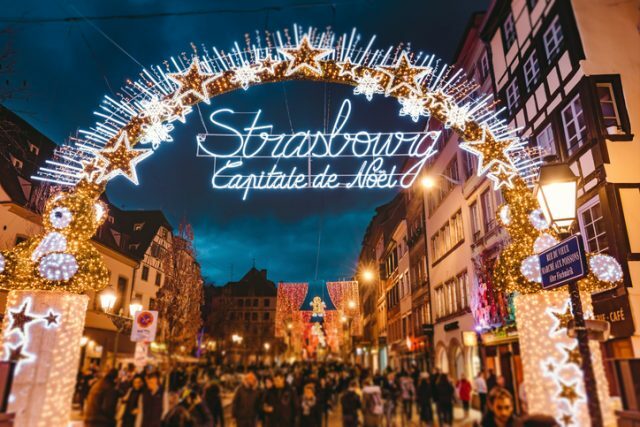 Hosting one of the oldest Christmas markets in Europe, Strasbourg’s market has over 300 stalls in 10 locations throughout the city. 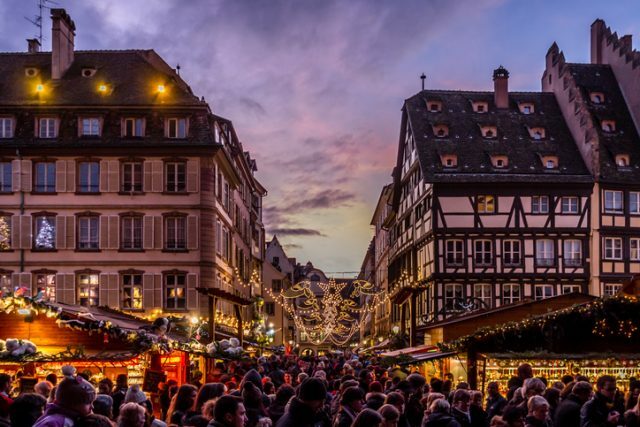 The first Christmas market in Strasbourg was in 1570, and was the very first of its kind in France. Entrance gate to the start of main shopping street and city centre of Strasbourg at Christmas time in Strasbourg, Alsace, France. 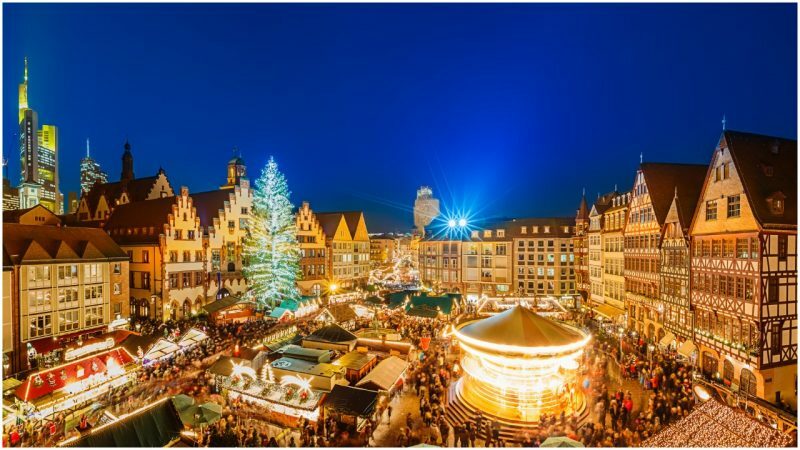 While the Christkindelsmärik came into being in the 16th century when Alsace became Protestant, the city’s Klausenmärik dates back to the 12th century and was held on December 6th – St. Nicholas Day. People at the Christmas market in Place de la Cathédrale of Strasbourg, considered the capital of the historical region of Alsace. The city is the official seat of the European Parliament. 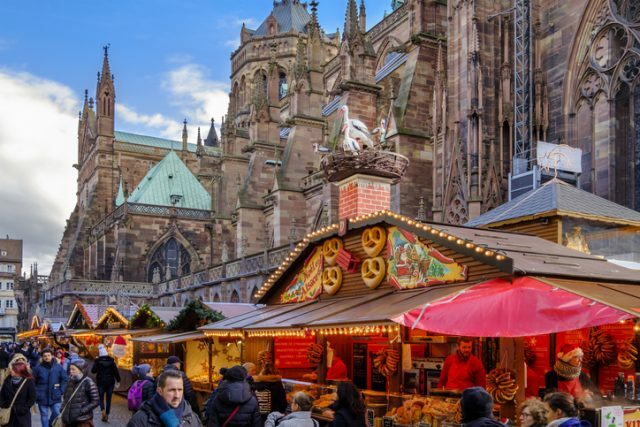 The Strasbourg market has maintained its strong German feel because the area of Alsace bridges both German and French heritage. And, like Munich, the market boasts an enormous Christmas tree, standing at least 30 metres (100 feet) each year. Every year an area of the market is dedicated to a “guest country” to show off its unique heritage and culture. In 2018, the guest country is Finland. Barcelona, Spain, November 28, 2017: People at the stalls of the Mercat de Santa Llucia, the popular Christmas market that is installed every year in front of the Cathedral during the holiday season. 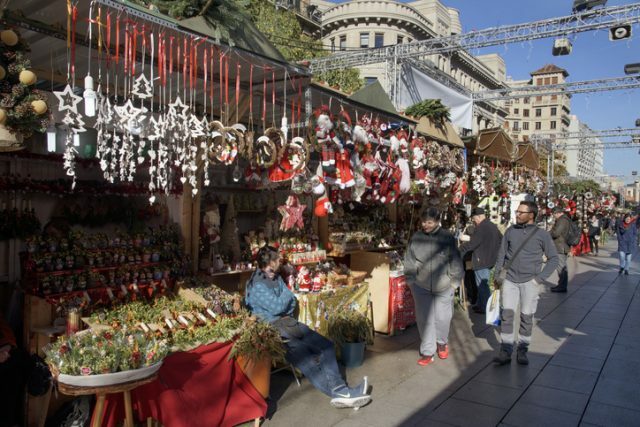 While not known for its white Christmases, the festive market in Barcelona dates back to 1786. What started as a 1-day event on December 13th in honour of Santa Llúcia developed into a traditional advent market. Barcelona, Spain, November 28, 2017: The Mercat de Santa Llucia Christmas market. The market is located in front of Barcelona Cathedral in the gothic part of the city. 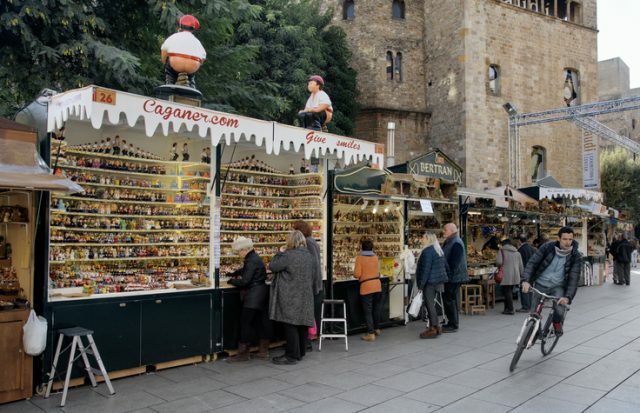 It has over 300 stalls with the traditional Christmas ornaments and food, as well as puppets, jewelry, musical instruments, and figuritas de Belén, which are small nativity figures that you use to make your own crèche. In the local language of Catalan, these scenes are called Pessebres. One of the most popular aspects of the fair is the caga tio, which is a large piñata-style Christmas log filled with candy and gifts. 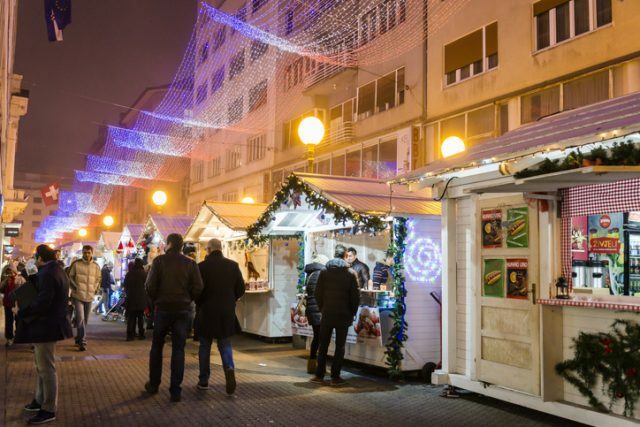 Zagreb, Croatia, December 20, 2015: Traditional Christmas market with shoppers and stalls at night. Voted the “best Christmas market destination” three years in a row by those who use the European Best Destination travel site, the market in Zagreb features incredible lights, decorations and lots of open-air entertainment, not to mention the traditional food and drink stalls, as well as vendors selling all manner of Christmas decorations and gifts. What makes the market special are its enormous Christmas tree, a fountain with a light display, and a warm, covered conservatory where one can find hot food and plenty to drink. Throughout the advent fair, live music is also a feature. There is also an area dedicated to “fooling around” or fulirange, where visitors can dance, eat and drink in a relaxed atmosphere.